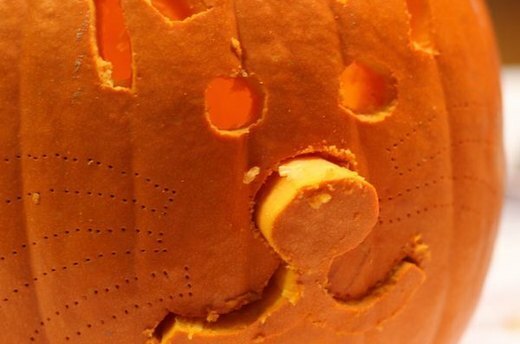 Halloween is upon us, and that means it’s time to carve up some ghoulish gourds. 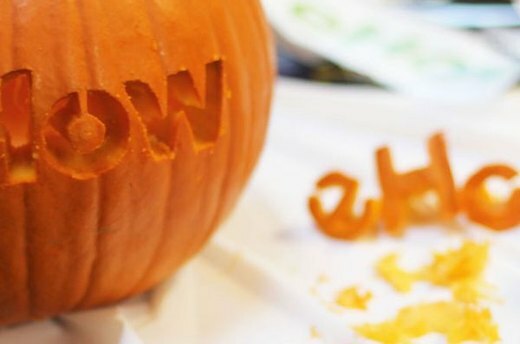 eHow's library of pumpkin carving templates is -- ahem -- to die for, so we decided to try our luck at carving some of these quick and creepy jack-o'-lantern. Here’s what we came up with -- and what we learned along the way. 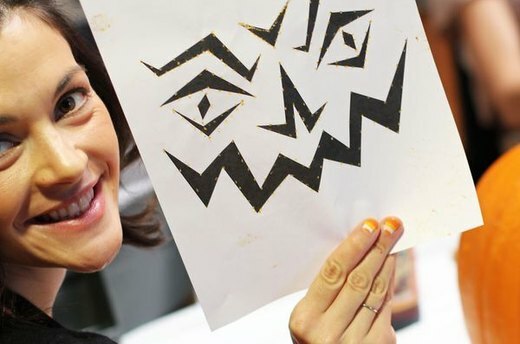 As much as we all like to think we can freestyle a masterpiece jack-o'-lantern, we learned that templates are our friend when it comes to carving. If you only have an hour or two to flex your creative muscles, don't think twice about taking advantage of an existing template that strikes your fancy. We picked up a pumpkin carving kit with two different sized saws and a scraper, but we found that a sturdy steak knife from the kitchen was our best bet for cutting out the thick rind around the stem . It's well worth the few bucks you'll spend at the supermarket to pick up a carving kit -- the small tools help with the finer details -- but plan to supplement your toolkit from your kitchen. 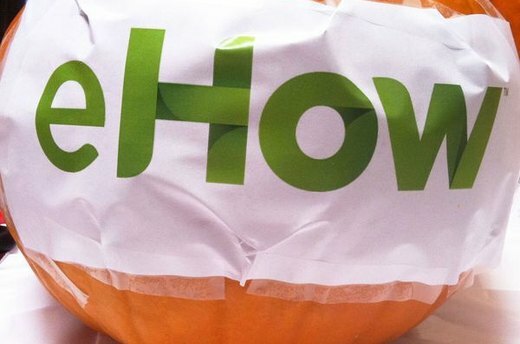 A little tape comes in handy to affix your template (or your eHow logo, as the case may be!) 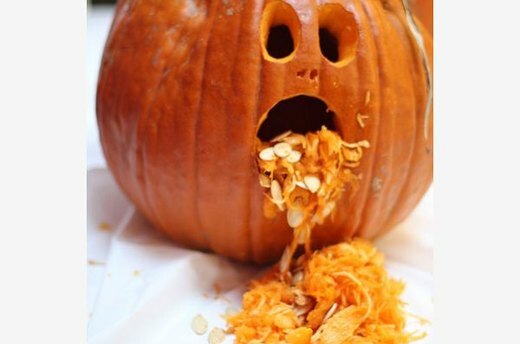 to your pumpkin. 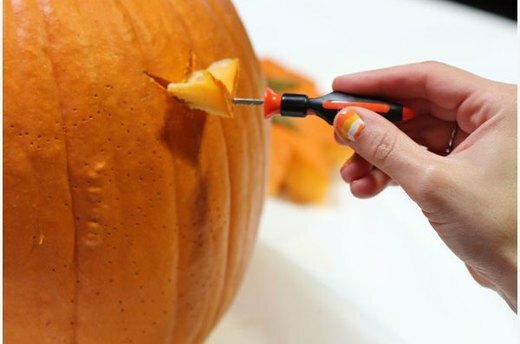 With the template attached to your pumpkin, use a pointy object to poke holes around the edges of the template, outlining its shape on the pumpkin's skin. Our carving kit came with this little red pick, but you could also use a toothpick, thumbtack or another pointed object you have at home. And, voila! 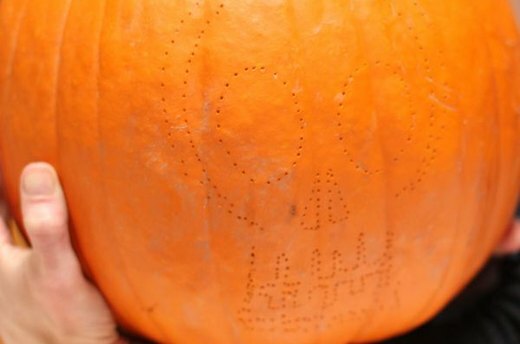 Here is the "Scared Skull" pumpkin carving stencil -- look closely to see the outline! Now it's time to start carving! Use your dotted outline as a guide. We used the tiny saws that came in our kit, but you can also use a kitchen knife. We recommend placing the pumpkin in your lap for an easier angle. Carve slowly, but steadily to avoid slashes in the wrong direction! Steady one hand with the other when you get to tricky parts of the pattern. Gently start to push out the excess rind from the inside. The more intricate your design, the gentler (and more patient) you'll need to be. 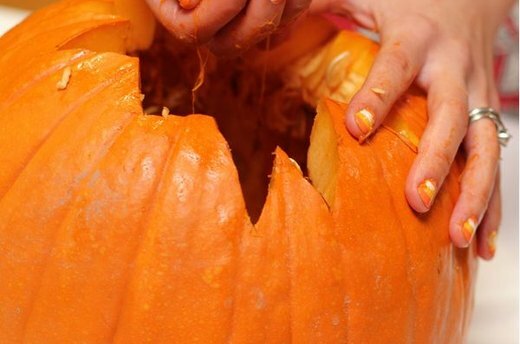 Once you've carved out the basic shape, use your saw or knife to clean up the inside edges, which will show even more once they're back-lit with a candle. 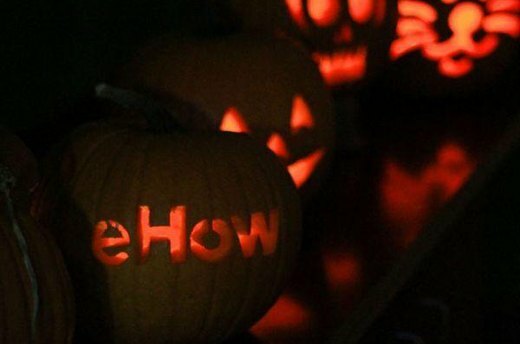 For any pieces that are unstable or not connected to anything, as in the case of the "e" and the "o" in eHow, you can hold them in place with a toothpick pushed in from the back. 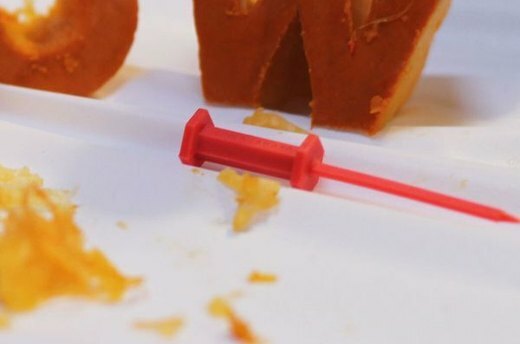 Since we didn't have toothpicks, we used the tine from a plastic fork to connect free-hanging pieces to the body of the pumpkin. (1) In your photo editing software, dial up Brightness and Contrast. Brightness will make photos pop more in your friends' Facebook news feeds (and that's what matters, right?). Contrast makes the lines cleaner. (2) Add Saturation -- not too much unless you want a seriously psychedelic pumpkin! (3) Play with Lightness. Non-professional photographers don't have flawless lighting; this is our work-around. You can use Photoshop if you have it, or download a free photo editing software such as Paint.NET. These jack-o'-lanterns were carved with the "Boo Ghost Face" and "Scared Skull" pumpkin carving stencils. 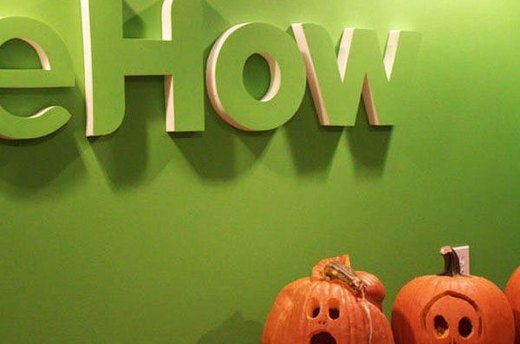 Happy Halloween from all of us at eHow! 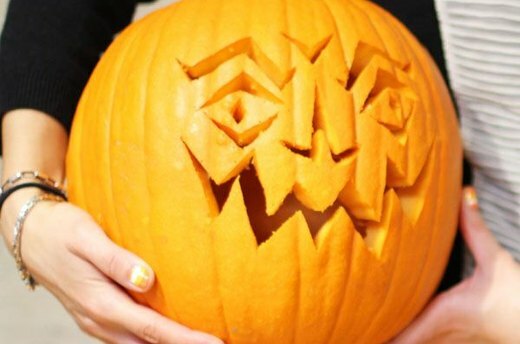 Now that you have have everything you need to start your pumpkin carving, we want to see your jack-o'-lanterns! We'll feature the best one(s). Here's how: (1) Go to our Facebook page (http://on.fb.me/mhHnrp). (2) At the top of our Wall, click on "Photo" and then "Upload a Photo." (3) Tell us a little about how you created it and hit "Share". You can see everyone's pumpkin pics and your own in our Photos tab (http://on.fb.me/vaffok)! Oops, Boo had a little too much fun.